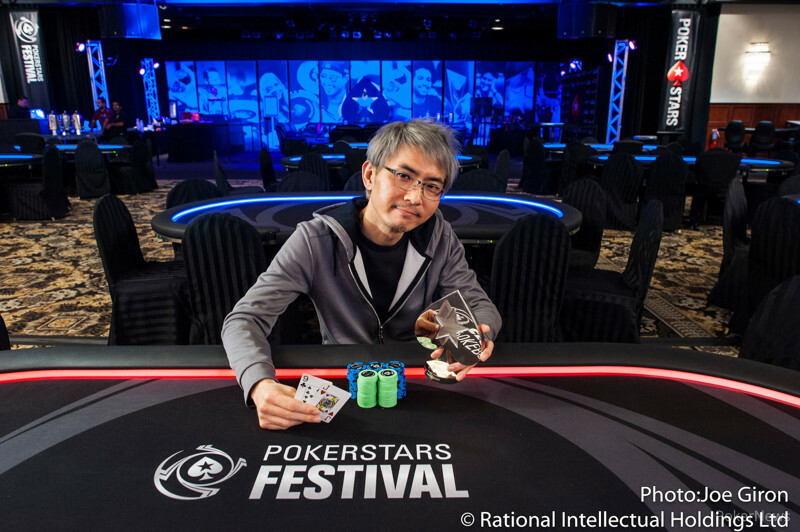 The $300 NL Hold'em PokerStars Cup drew a field of 107 entries over three starting flights. 21 players advanced to Day 2 this evening and when it was all said and done, Je Wook Oh emerged victorious for a first-place prize of $6,520. Oh began Day 2 second in chips and immediately took charge. 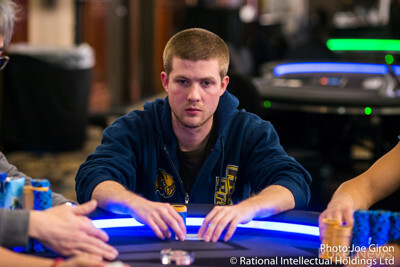 Sitting to the immediate left of start-of-day chip leader Thomas Miller, Oh took a chunk of his chips early on and seized the chip lead for himself, never giving it up from that point forward. With 11 players remaining, Oh picked up ace-queen and eliminated Team PokerStars Pro Chris Moneymaker who held pocket fours. An ace found the board and Moneymaker was sent packing. Oh entered the unofficial final table of nine players with about 30% of the chips in play and steadily chipped up from there. His elimination of Eric Rivkin in third place gave him a 7:1 chip lead to begin heads up play, and though Timothy Cipoletti chipped up a bit, Oh closed out the heads-up duel soon after. Timothy Cipoletti limped from the button and Je Wook Oh checked his option. The flop came down and Oh led for 33,000. Cipoletti called. The turn was the and Oh checked to Cipoletti who bet 53,000. Oh check-raised all in and Cipoletti let out a big sigh. "So you don't have a straight," said Oh. "Ha, nope, no straight. Alright I'll call," said Cipoletti, committing his remaining 500,000 or so. Oh tabled for top two pair, leading Cipoletti's for top pair with a straight draw. The river was the , no help to Cipoletti, ending his tournament in second place for $4,900. The flop fell and Oh led for 26,000. Cipoletti called. The turn was the and Oh bet 65,000. Cipoletti called. The river was the and Oh bet 77,000. Cipoletti raised all in for about 280,000 and Oh quickly folded. Je Wook Oh limped from the small blind, Eric Rivkin raised all in for about 310,000 from the big blind, and Oh called. "I felt like you were limping strong, too," said Rivkin. 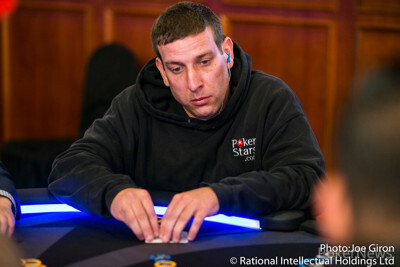 The board came down , no help to Rivkin, ending his tournament in third place. The players are in the midst of a 15-minute break. 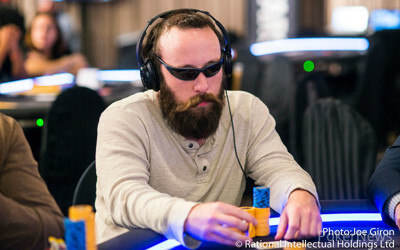 Eric Rivkin raised to 28,000 from the button, David Kuder reraised all in from the small blind for 85,000, and Rivkin called after a few moments. The board came down , giving Rivkin kings and nines to eliminate Kuder in fourth place for $2,800. 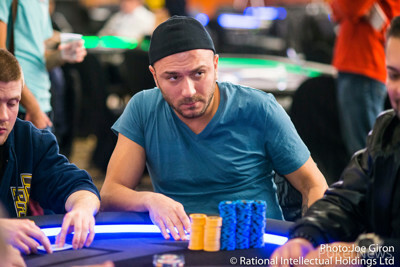 Samir Benjamin raised from the cutoff and Timothy Cipoletti called from the big blind. The flop fell and Cipoletti checked to Benjamin who bet 24,000. Cipoletti called. The turn was the and Cipoletti checked again. Benjamin shoved for 89,000 and and Cipoletti called all in for 84,000 with , having the pot locked up against Benjamin's . The river was an inconsequential , securing the pot for Cipoletti. Down to 5,000, Benjamin busted two hands later. 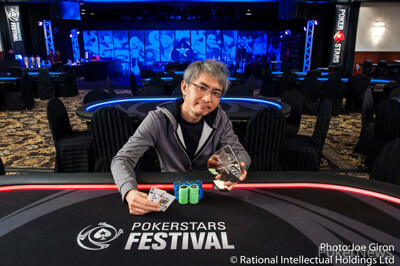 Je Wook Oh raised to 25,000 from the hijack, Andrew Irwin three-bet shoved for 90,000 from the cutoff, and Oh called. The board ran out , no help to Irwin, ending his tournament in sixth place.